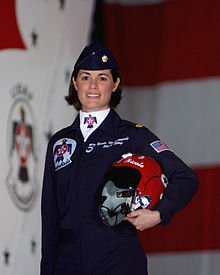 Nicole Margaret Ellingwood Malachowski (born September 26, 1974) is a retired  United States Air Force officer and the first female pilot selected to fly as part of the USAF Air Demonstration Squadron, better known as the Thunderbirds. Her aviator call sign is "FiFi". Her first public performance was in March 2006 and she spent the 2006 and 2007 air show seasons flying the Number 3 (Right Wing) aircraft in the diamond formation. Prior to attending the U.S. Air Force Academy and joining the USAF, Colonel Malachowski was a Civil Air Patrol Cadet. Between September 1, 2008 and August 31, 2009, Malachowski was on special assignment, participating in the White House Fellows Program for the Class of 2008–2009, assigned to the General Services Administration. In September 2015 Malachowski returned to the White House as executive director of its Joining Forces initiative for supporting veterans, service members, and military families, succeeding U. S. Army Colonel Steve Parker. Nicole Malachowski was born Nicole Ellingwood in Santa Maria, California, to Cathy and Robert Ellingwood. In high school, she was a cadet member of the Nevada Wing of the Civil Air Patrol and participated in AFJROTC, where she was rated cadet colonel, the highest rank a cadet could achieve. She started working on her pilot's license before graduating from high school. She graduated from Western High School in Las Vegas in 1992. She earned a Bachelor of Science degree in Management, with a minor in French, from the United States Air Force Academy, graduating 124th of 922 in the Class of 1996. While at the academy she was both a pilot and cadet instructor pilot in the academy's TG-4 glider program. She also earned a Master of Arts degree from American Military University in National Security Policy, and a second in National Security and Strategic Studies from the United States Naval War College, where she graduated with highest distinction. Malachowski is married to Lieutenant Colonel Paul G. Malachowski (USAF, retired), a former F-15E Weapons System Operator. The couple met while both were serving as aircrew in the 48th Fighter Wing at RAF Lakenheath in the United Kingdom. In April 2010 she was admitted to the Mother and Infant Care Center (MICC) of the National Naval Medical Center in Bethesda, Maryland, in expectation of the birth of twins. After a confinement of nine weeks, she gave birth to daughter Norah and son Garrick on June 6, 2010. Malachowski attended undergraduate pilot training at Columbus AFB, Mississippi. She finished fourth in her class and selected the only F-15E Strike Eagle slot allotted to her class. After meeting height requirements for fighter pilots, she trained at Seymour Johnson AFB, North Carolina, with the 4th Fighter Wing. Major Malachowski (far right) at July 2009 White House ceremony honoring WASPs. Malachowski was selected to participate as a White House Fellow in Washington, D.C., from September 1, 2008 to August 31, 2009, working in the General Services Administration with the Presidential Transition Support Team and as deputy chief of staff. Malachowski has been an advocate of recognition as veterans of women pilots who served during World War II. On July 1, 2009, she participated in a White House ceremony at which legislation (S.614) awarding a Congressional Gold Medal to former pilots of the Women Airforce Service Pilots (WASP) was signed into law by President Barack Obama. 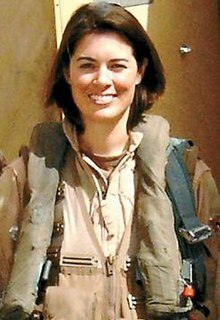 Although she had to use a wheelchair due to a broken left leg, Lt Col Malachowski delivered remarks during the ceremony held March 10, 2010, in the United States Capitol awarding Deanie Bishop Parrish the medal on behalf of all 1,102 WASP pilots. She completed her assignment with the 333d in May, 2013 and reported to the Naval War College in Newport, RI as a student. ^ "Class of 2008" (PDF). American Military University. Archived from the original (PDF) on July 7, 2011. Retrieved October 25, 2012. ^ a b "Nicole Malachowski". Allied Forces Foundation. Archived from the original on 27 May 2018. Retrieved 12 June 2018. ^ Wood, Sara (October 11, 2006). "First woman Thunderbird pilot proud to serve". United States Department of Defense. Retrieved July 12, 2007. ^ a b c d "Nicole M. Malachowski". Veterans Tributes. Archived from the original on 2009-11-25. Retrieved October 25, 2012. ^ "Jining Forces' new leader has cockpit, White House experience". Military Times. Retrieved October 5, 2016. ^ a b c Lake, Richard (June 17, 2005). "Female Thunderbird: First in Flight; Western High School grad makes history". Las Vegas Review-Journal. Retrieved December 24, 2008. ^ "Lady Thunderbird". Women In Military Service For America Memorial Foundation, Inc. November 2008. Archived from the original on May 16, 2008. Retrieved December 24, 2008. ^ a b c Office of the Press Secretary (June 2008). "President Bush Appoints 2008–2009 Class of White House Fellows" (Press release). The White House. Retrieved December 24, 2008. ^ a b Tchen, Tina. "Joining Forces Announces New Executive Director". whitehouse.gov. Retrieved 5 October 2016. ^ Lake (June 17, 2005). "The Air Force's requirements state that fighter pilots must be at least 5 feet 4 inches tall." ^ Shoop, Tom (October 7, 2008). "First Woman Thunderbird Lands at GSA". FedBlog. U.S. General Services Administration. Retrieved October 25, 2012. "First Woman Thunderbird Lands at GSA" (Press release). GSA. emailwire.com. October 8, 2008. Retrieved October 25, 2012. ^ "Gallery: The WASPS of World War II". McClatchy.com. Archived from the original on September 10, 2012. Retrieved August 14, 2010. ^ "Deanie Bishop Parrish". Wingsacrossamerica.us. Retrieved January 15, 2012. ^ "Wings Across America - main page". wingsacrossamerica.us. . Includes YouTube video of 2010 Malachowski remarks. ^ "Change of Command ceremony, 333d Fighter Squadron". Seymourjohnson.af.mil. Archived from the original on April 6, 2012. Retrieved January 15, 2012. ^ a b Crolley, Brittain. "First female Thunderbird takes last flight at SJ". USAF. Archived from the original on January 11, 2016. Retrieved July 21, 2014. ^ "2008 WAI Pioneer Hall of Fame Inductees". Women in Aviation. March 2008. ^ "Air Force Releases Colonel, Major Promotion Lists". military.com. February 11, 2015. Retrieved September 10, 2015. ^ "March officer promotions". airforcetimes.com. Retrieved August 14, 2010. "Major Nicole Malachowski and Major Samantha Weeks". Woman Pilot. April 2, 2008. Retrieved December 24, 2008.